Notice this tomato looks deformed and gnarly. It has 4 little tomatoes that have fused together-kinda like Siamese twins only this one is quadruplets! 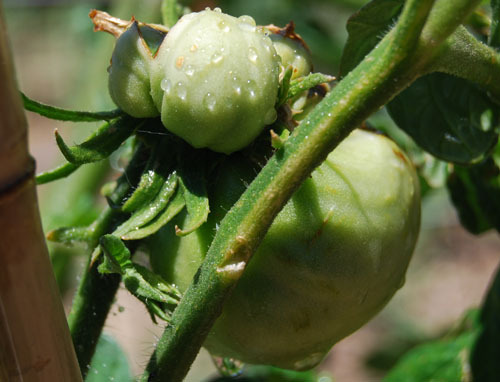 Most giant tomatoes are a result of a megablossom where 2 or more blossoms fuse together. Many megablossoms do not pollinate fully and so they have a higher self abort rate. So far this one is doing well. I have a few other megablossoms right now but not many. Some varieties produce more megablossoms and hence more giant tomatoes. Two varieties that have the potential of producing giant tomatoes are Delicious and Big Zac. There are other varieties that can produce giant tomatoes too. This one in the picture comes from a Nick Harp tomato seed. His plant grew a 7 lb+ tomato last year and he gave me a few seeds. I call his plants the ‘Harpies”! I have 5 growing right now. Hope this one becomes a monster! Since I’m an organic grower I’ve been feeding it fish and seaweed fertilizer from the Neptune brand. This entry was posted in GARDENING TIPS, general, GIANT TOMATOES, TOMATOES, tomatoes growing tips and tagged giant tomato, megablossom, organic gardening, tomato growing tips, tomatoes.